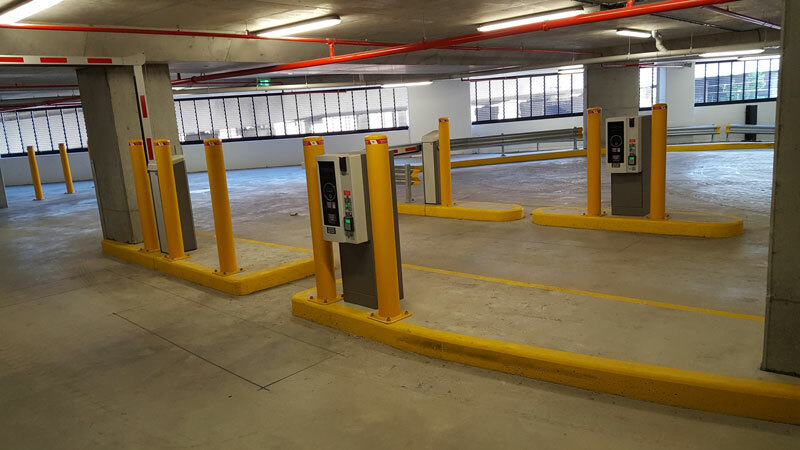 Carpark-King can supply & install wheel-stops, bollards, speed humps, height clearance bars, corner guards, convex mirrors, pipe protectors, bike racks and many other car park fixtures. If you cannot find what you require below, please do not hesitate to contact us, we may be able to source exactly what you are looking for! And many other car park fixtures. 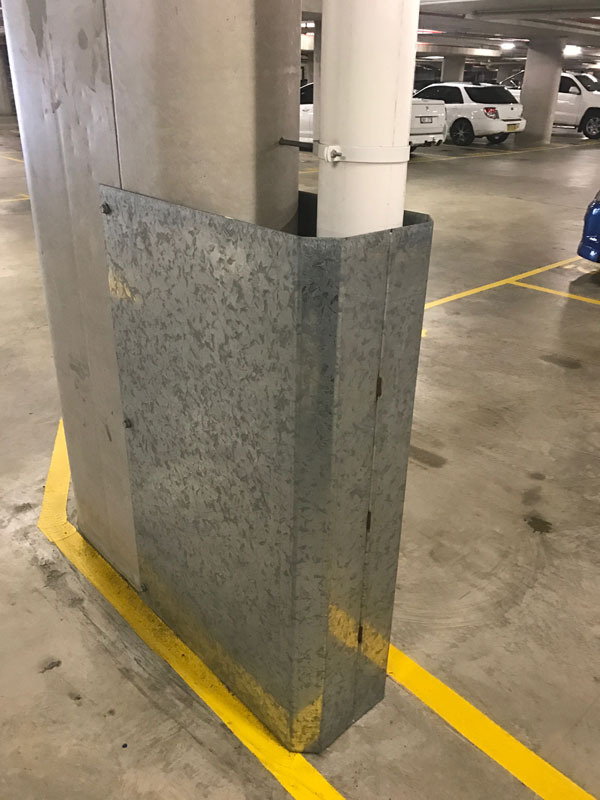 Wheel Stops are ideal for effective delineation of parking and for use in the protection of walls, vehicles & other valuables in all garages and surfaces parking applications. 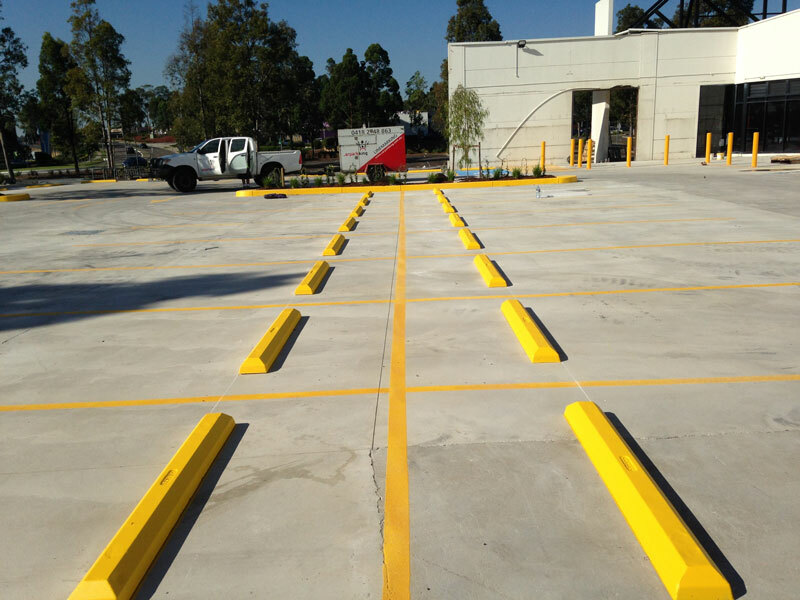 – Flexible, allowing for conformity to contour on virtually any road surface. 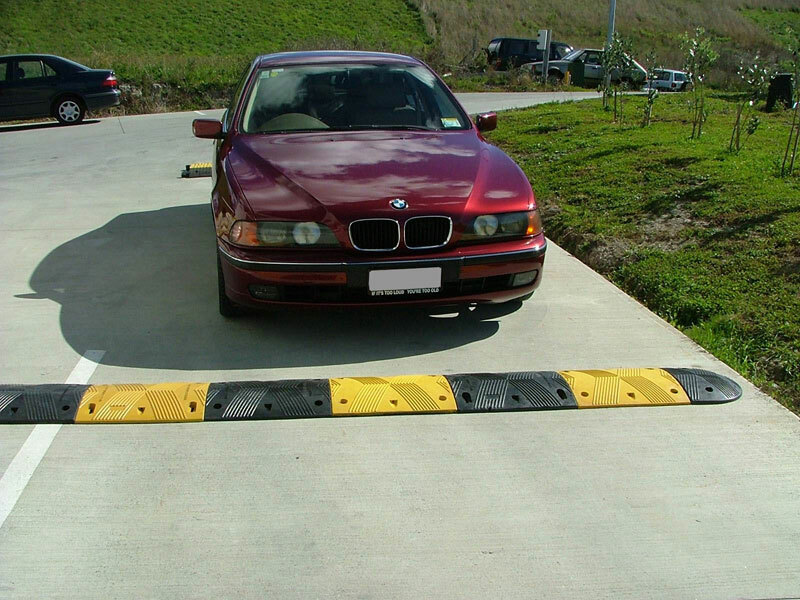 Heavy duty pre-cast concrete wheel-stops – Size 1650mm and 2000mm. Made from steel-reinforced concrete. 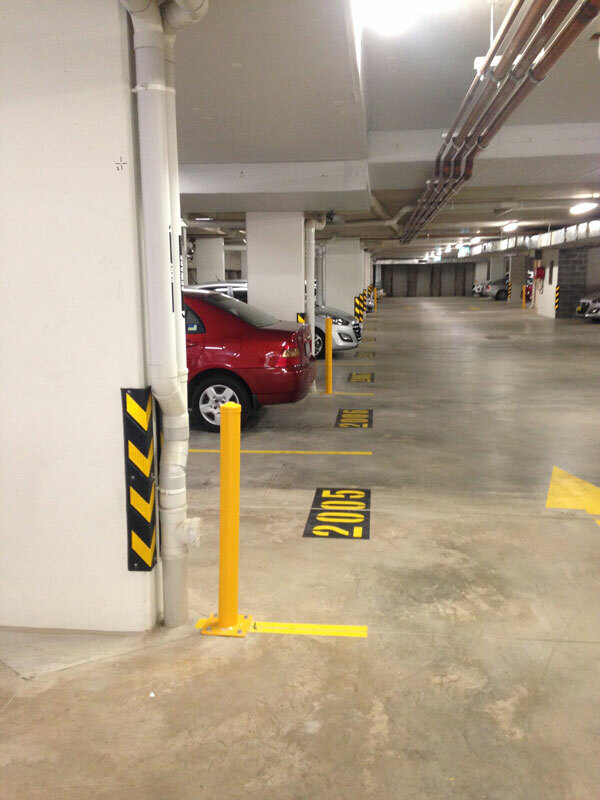 All our car park fixtures comply with the current Australian/NZ standards. 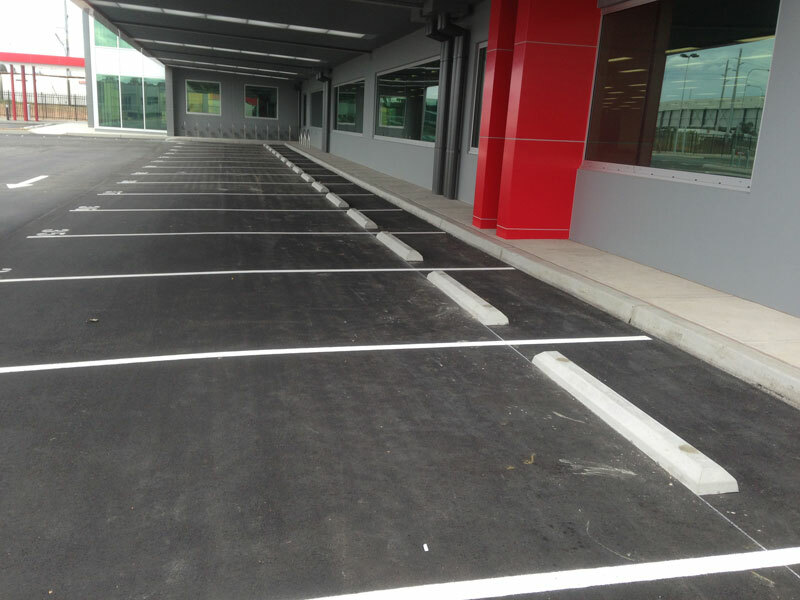 Speed Humps are suitable for use in confined areas of covered and multi-level car parks, commercial premises, petrol stations etc., anywhere that you wish to further slow the speed of vehicles travelling at 30km/h or less. 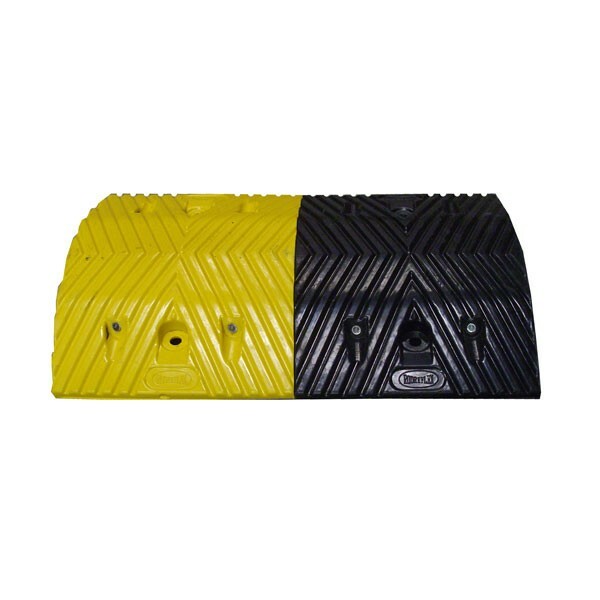 Our premium rubber speed hump with a ribbed surface to prevent slipping is manufactured from 50% natural rubber and 20% recycled rubber with other additives for durability. 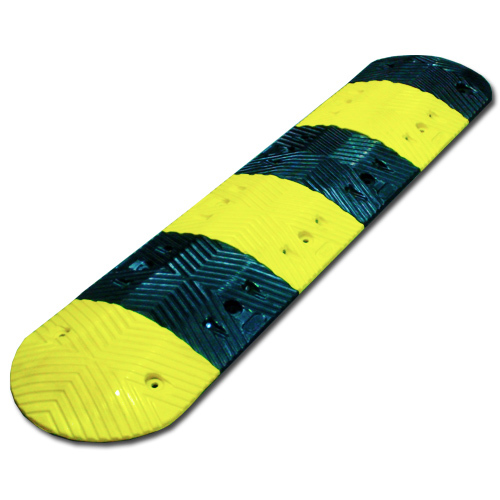 The black and yellow sections allow the product to be abutted together to make alternative striped patterns. These can then be made up to your required length by adding End Caps. 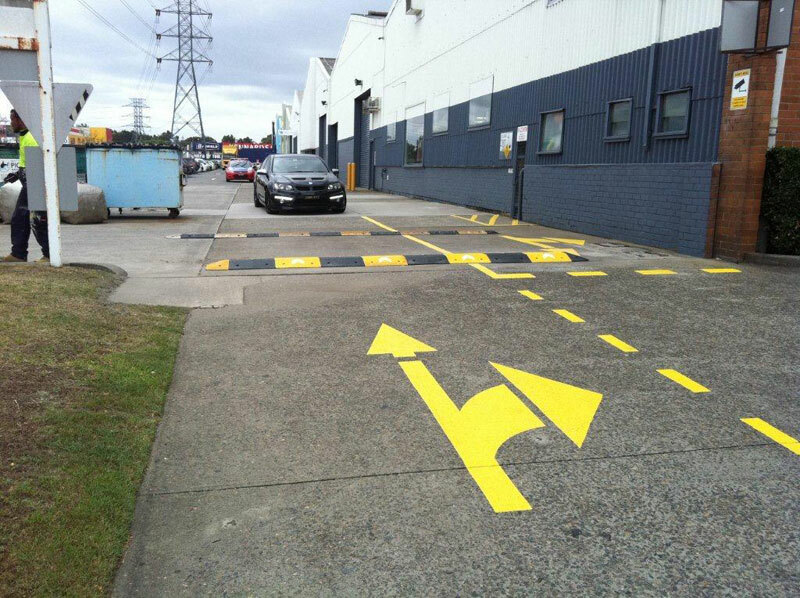 We supply both normal and aggressive speed humps. 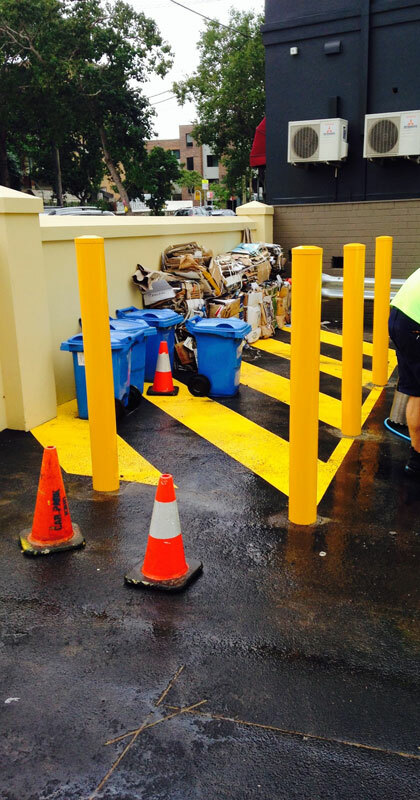 We can also supply and install rubber bunding for carwash bays. 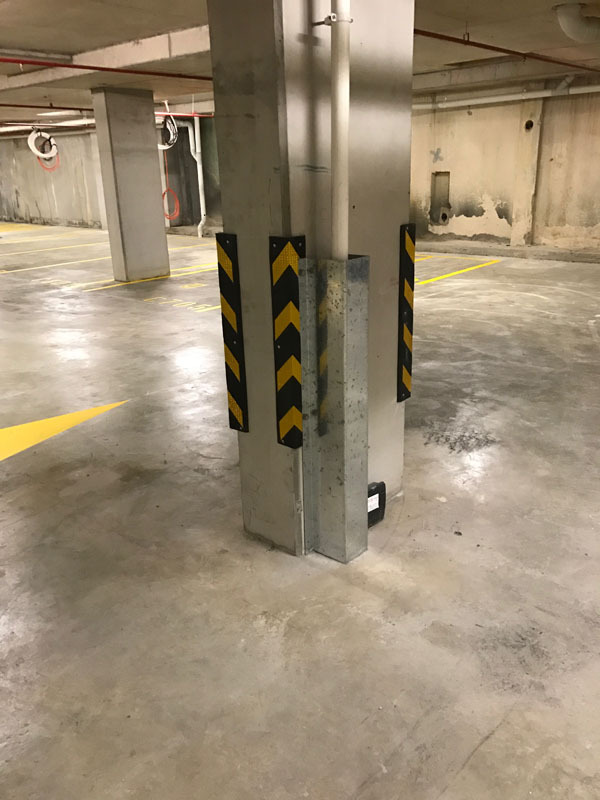 Bollards can be used in any area to separate vehicles and pedestrians, protect structures or inhibit vehicles from entering particular areas. 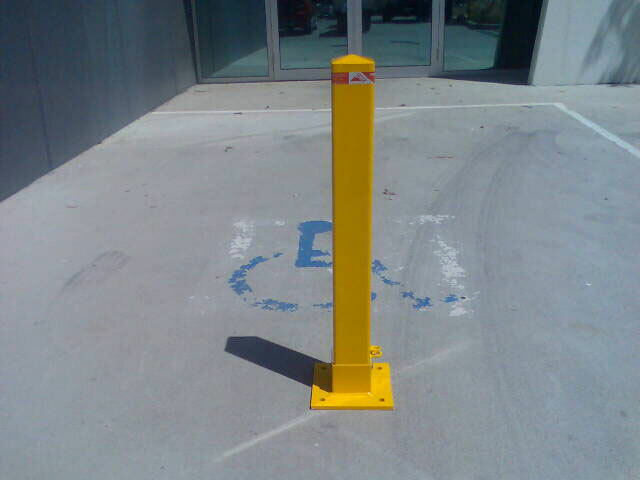 Bollards come in many different forms. Please contact us today with your specifications! 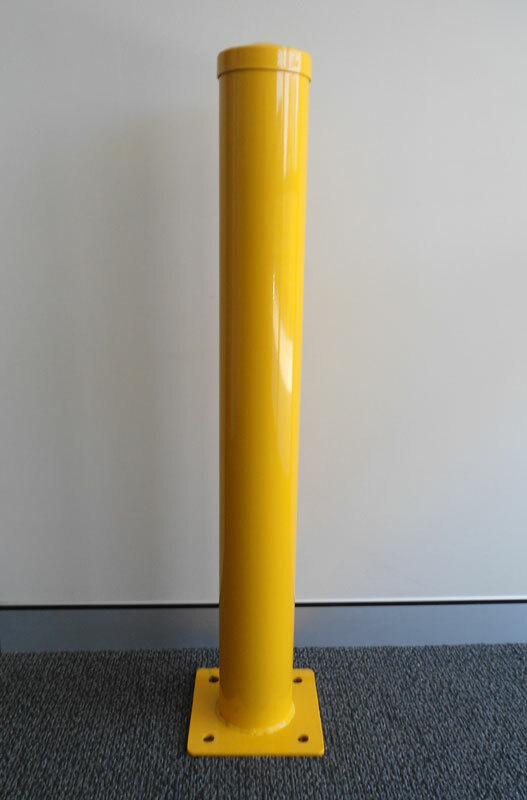 We can also have keylink eyeholes added to powder coated bollards to give you the option of having chain running between bollards for further protection of pedestrians, structures or objects. 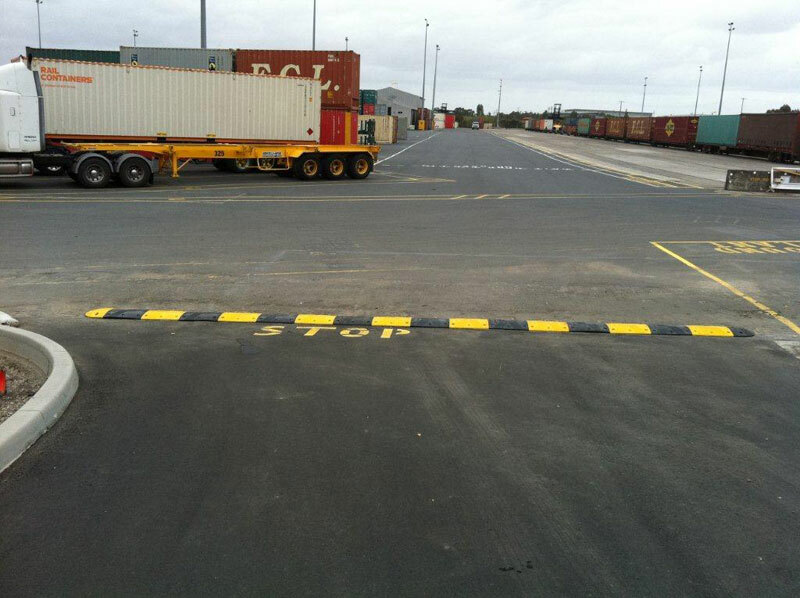 Height clearance bars are used as early warning signs as vehicles are entering undercover areas or will encounter an overhead obstruction. They will eliminate costly damage to vehicles and property. 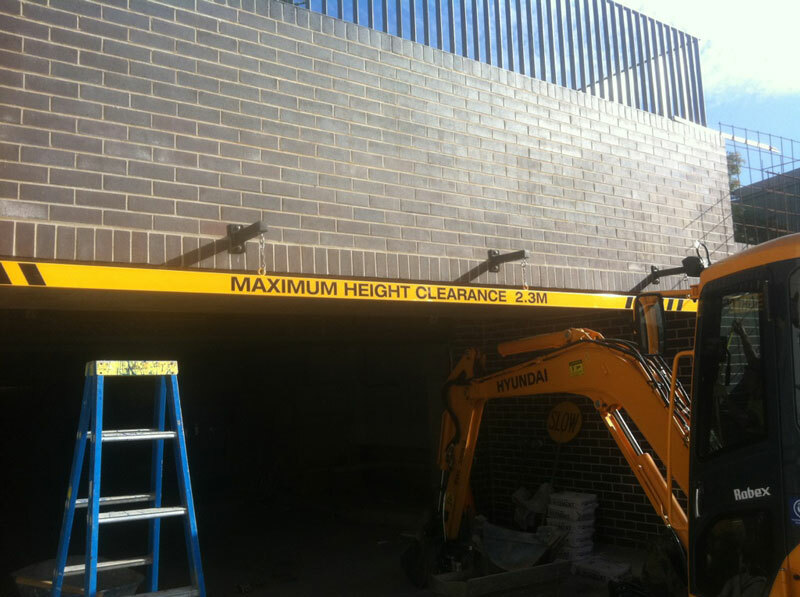 Our height clearance bars are customisable 2m lengths, up to 6m lengths. 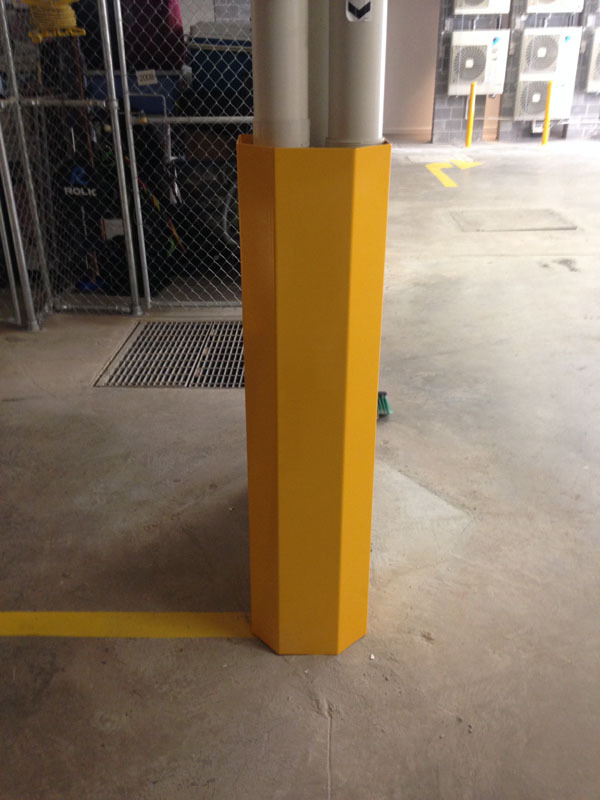 Constructed from heavy duty metal and powder coated yellow, they are heavy enough to endure windy areas. 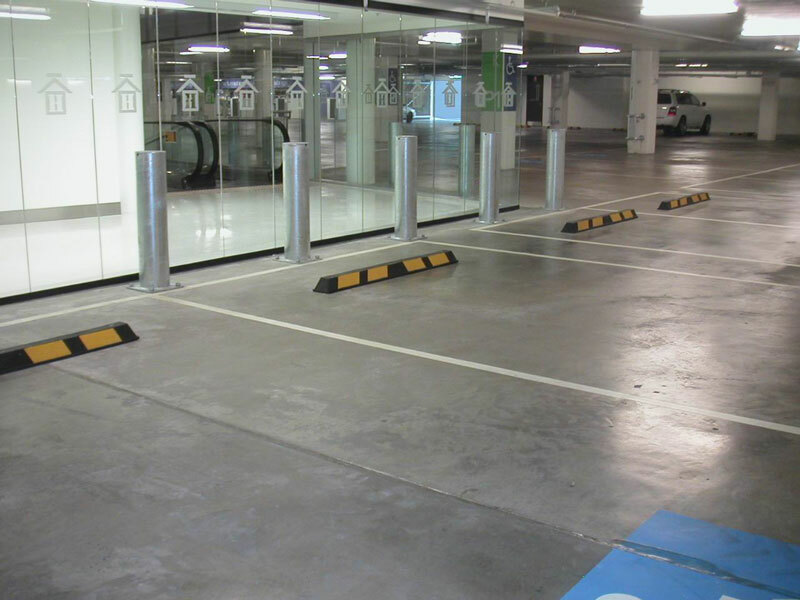 We can supply and install a range of multi bike rack parking to suit your needs. 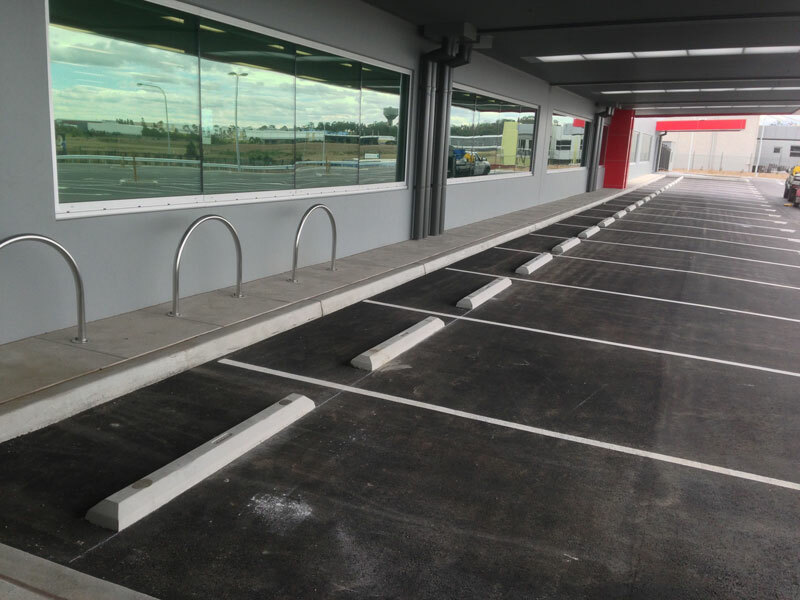 Our most popular model is the hooped design bike rack which comes in raw galvanised or stainless steel and is either surface mounted or inground installation. 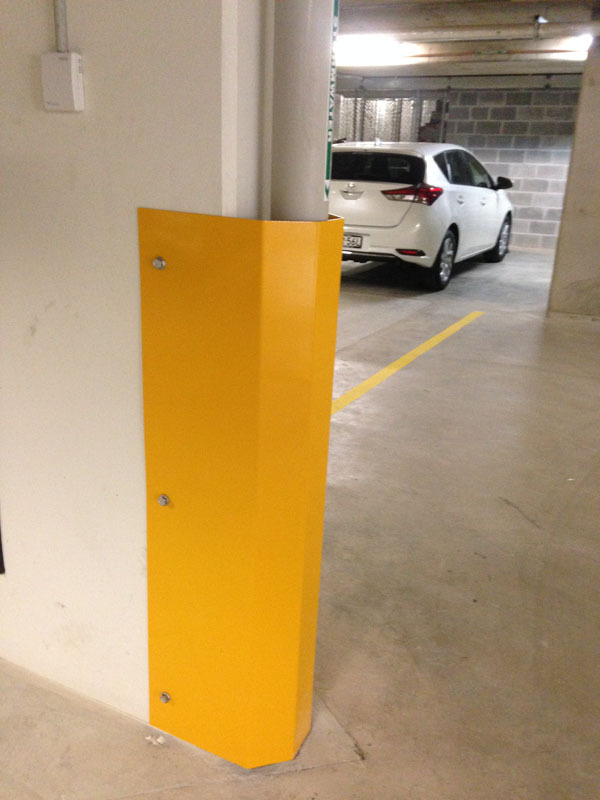 This bike rack can hold up to 2 bikes and is slim in design, great for compact spaces. 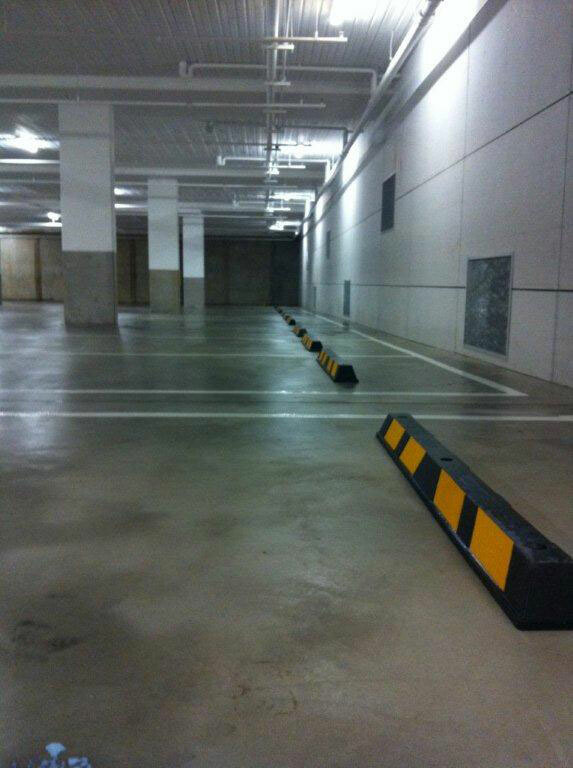 Corner guards are installed to protect exposed corners from vehicle traffic. 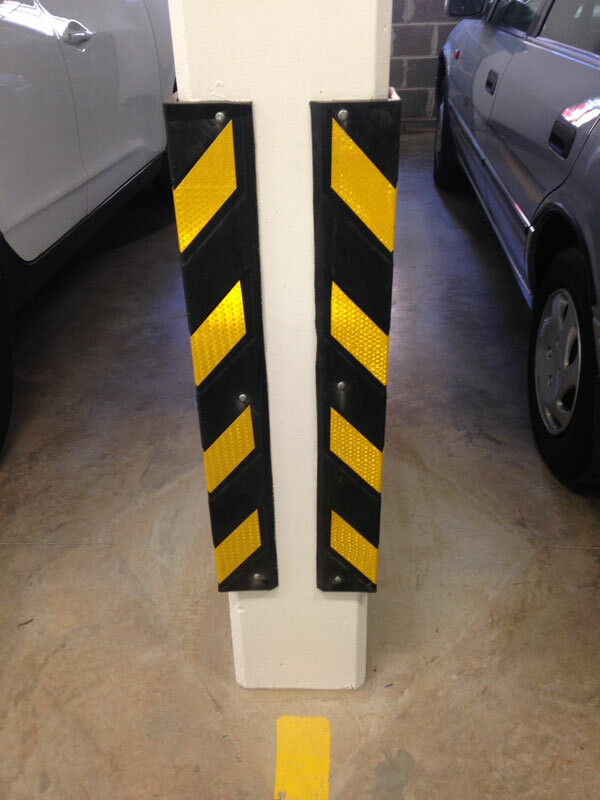 Our corner guards are constructed from black rubber with yellow reflector stripes which offer great high visibility. 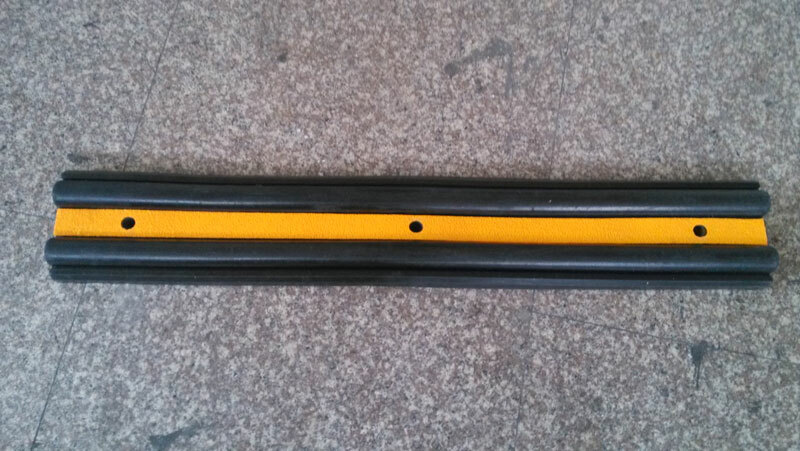 The flexible rubber will absorb most of the initial impact of a vehicle. 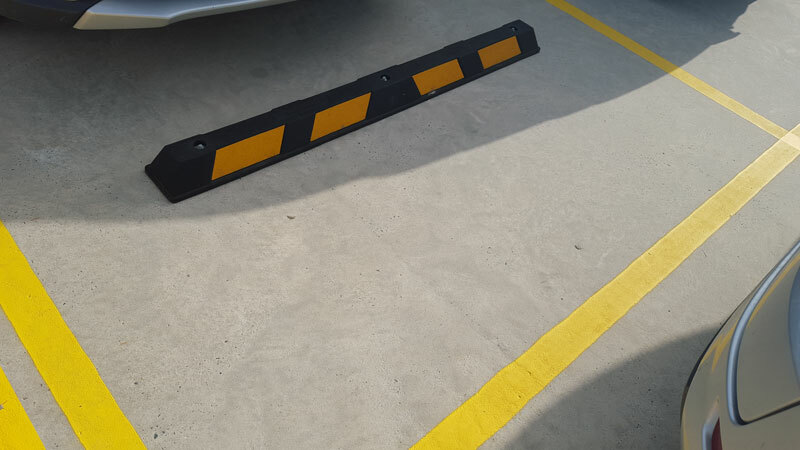 We also offer black rubber and yellow dock bumpers which are ideal for use in loading docks to protect walls from reversing trucks or mobile machinery. 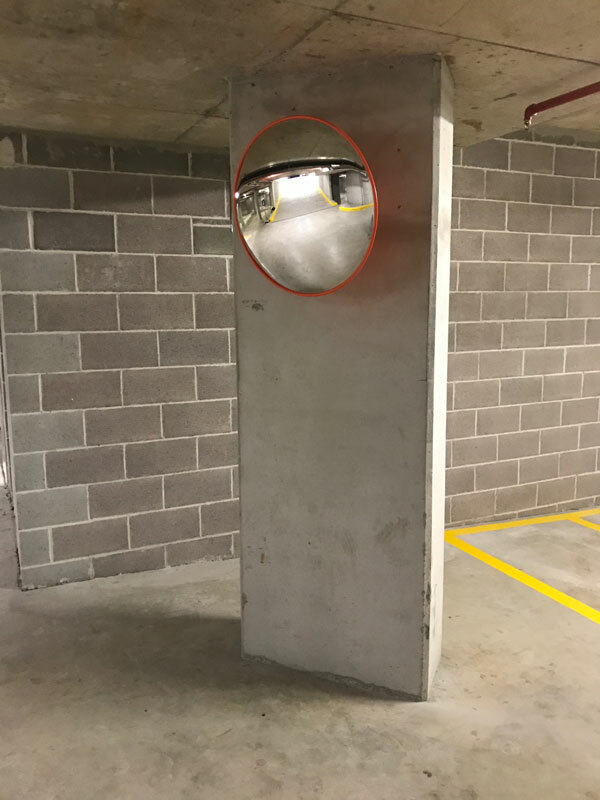 Convex mirrors are installed in areas which have blind corners or obscured view in vehicle traffic corridors. 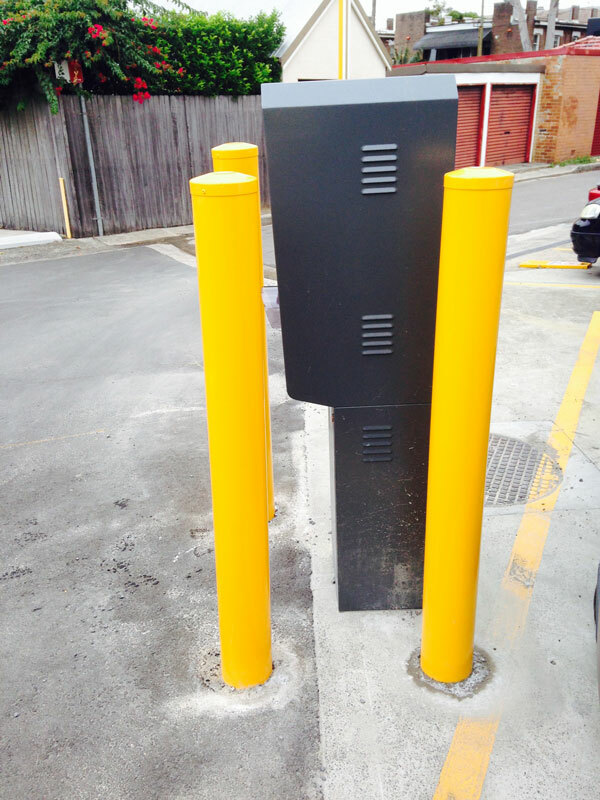 Strategically placed they help minimise collisions and assist pedestrians with an additional view point when crossing through the area. We have indoor or outdoor convex mirrors available, both in high visibility orange. Outdoor convex mirrors have an additional hood minimising sun reflection. All our convex mirrors are shatter proof and are of light weight construction. 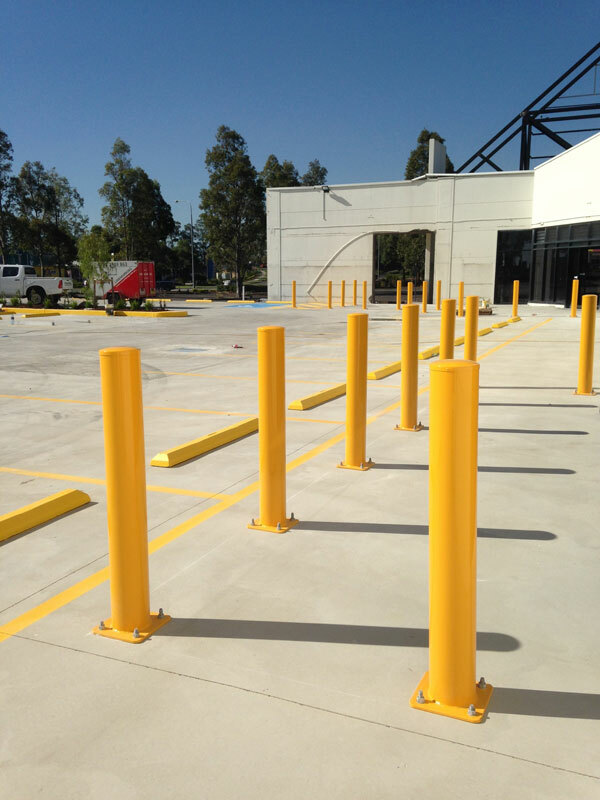 Pipe protectors are used to prevent damage to exposed pipes from moving vehicles or mobile machinery. 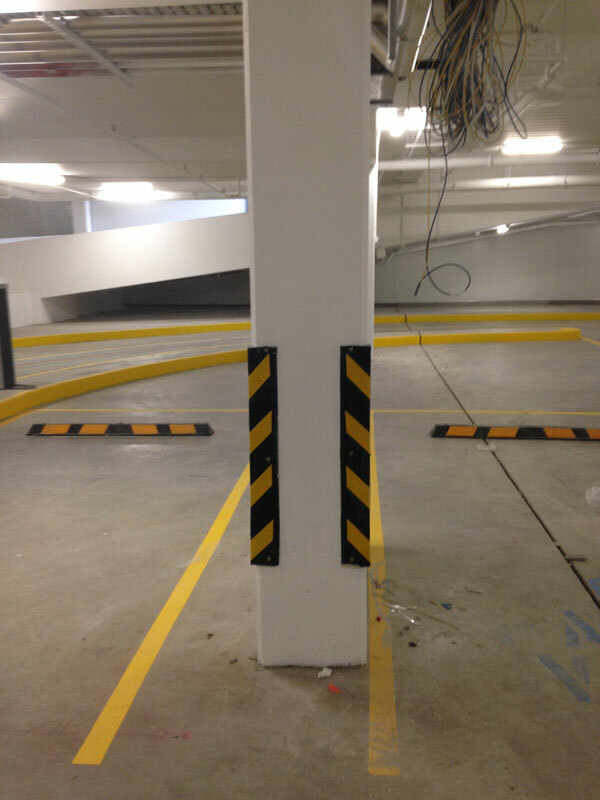 Our pipe protectors are completely custom size and are measured on site before manufacture. 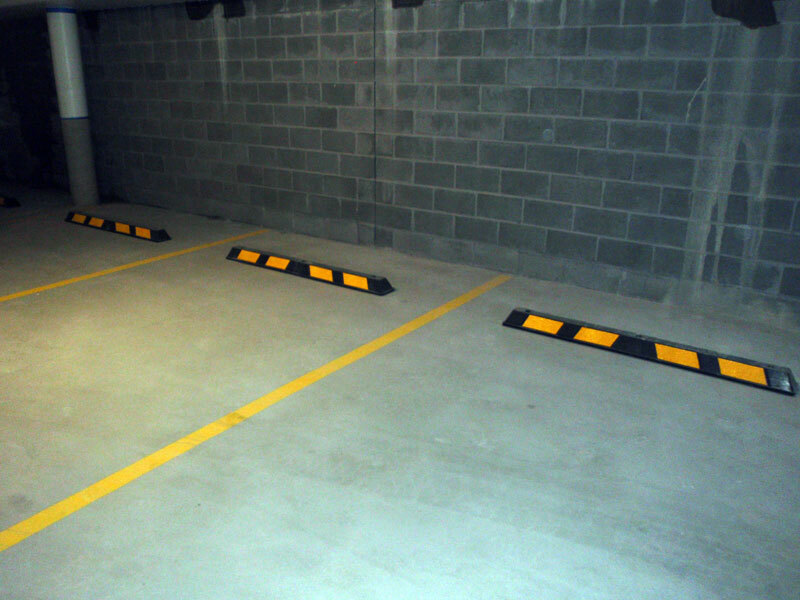 They are constructed of 3mm folded galvanised sheet metal available powder coated or left raw galvanised. 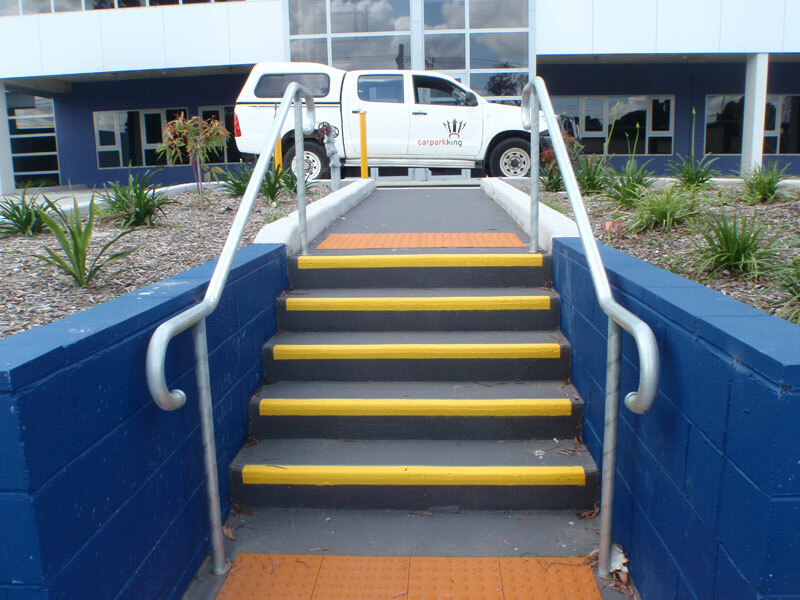 Stair nosing not only protects the stair edge from damage from high traffic they also offer hi-visibility and slip resistance for pedestrian safety. 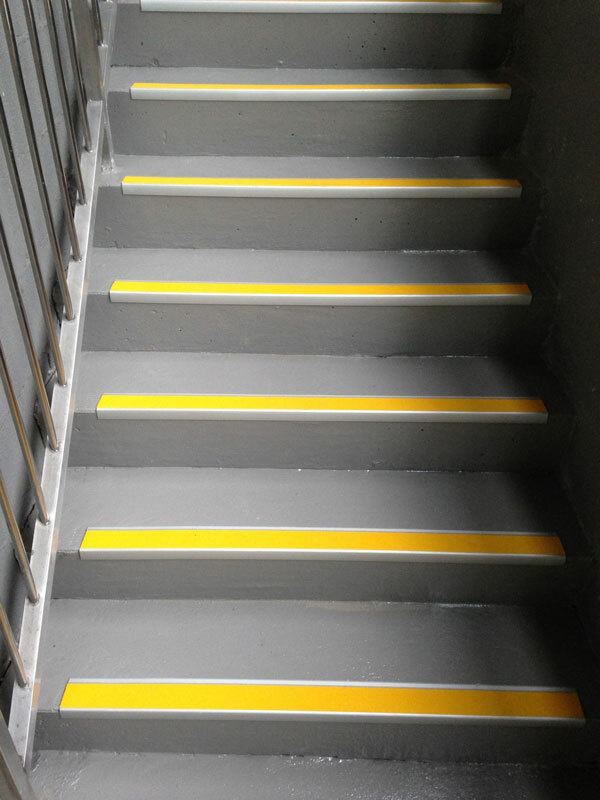 We offer installation of aluminium stair nosing with a non slip insert in either yellow or black. This method is long lasting and easy to repair in the future if required. 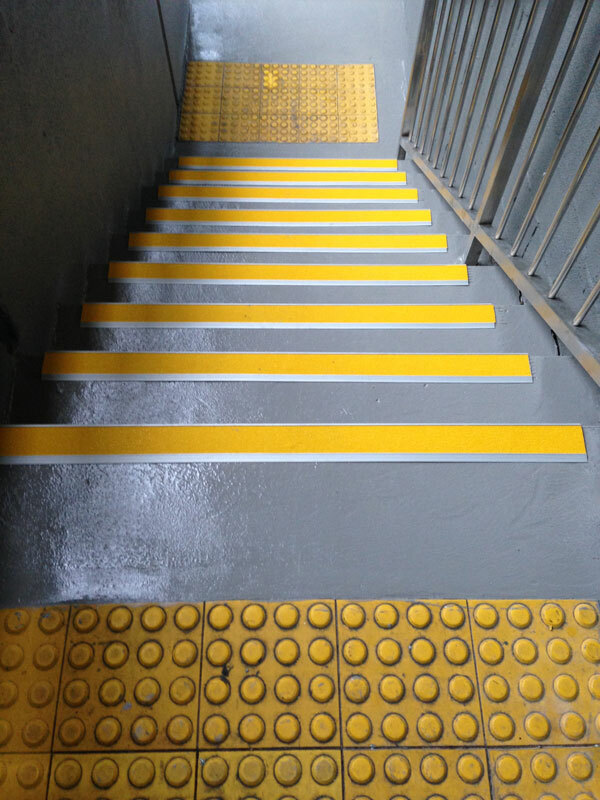 A cheaper alternative is to paint concrete stair edges with our heavy duty high visibility yellow linemarking paint with glass beads / or alumina powder distributed through to increase slip resistance. This method is not as long lasting as the paint will wear away in high volume areas and is recommended to be re-painted as required. 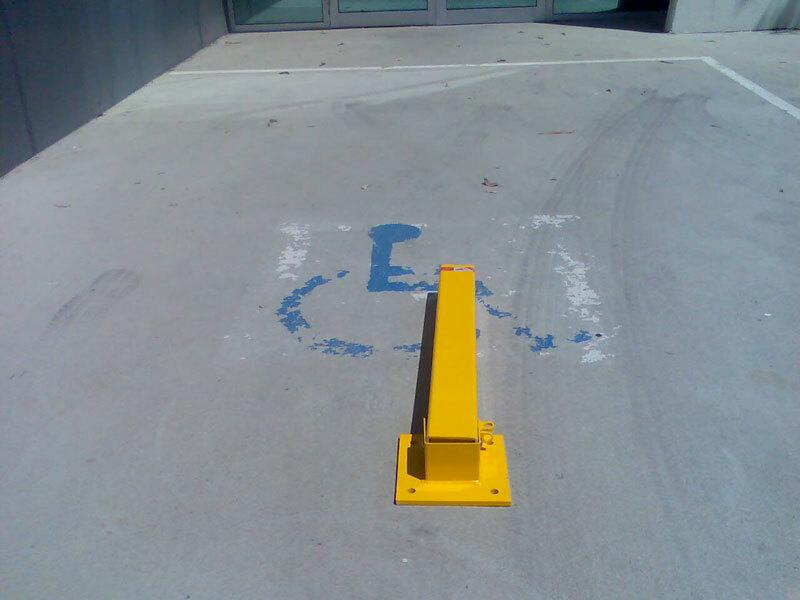 Tactile ground surface indicators are installed to assist pedestrians who are visually impaired. 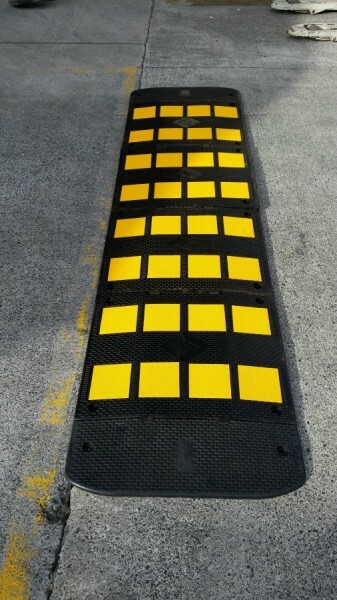 We can install hi-visibility tactile mats or individual tactile indicators in a range of different materials and colours. Please contact us with your specifications today!